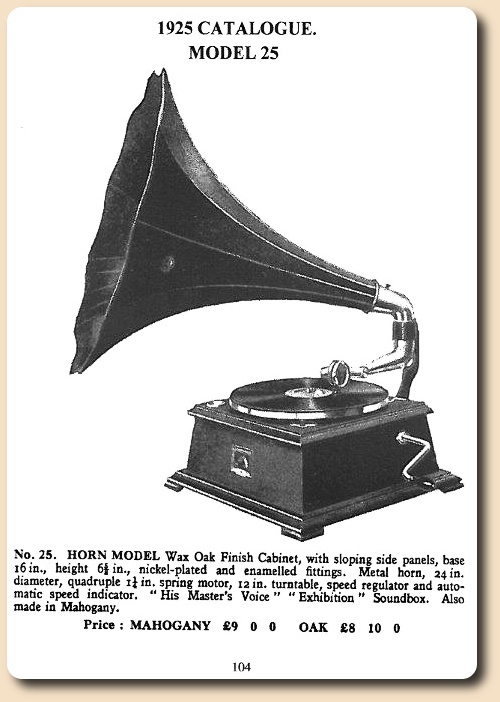 The HMV 25 was one of the last horn models that the Gramophone Company Ltd. produced for the home market. Originally it was a model for the indian market, but the Gramophone company adopted this model with an oak or mahogany case for the homemarket. PRICE: 8,10 GBP in Oak and 9 GBP in Mahogany. HORN: HMV Morning Glory, 23 1/2 in. The HMV 25 was one of the last horn models that the Gramophone Company Ltd. produced for the home market. Following the remarks of the book "His Masters's Gramophone", so this model was a result of the production of that model for or rather in India. Horn models were still in demand in india so there were serverel horn models available. 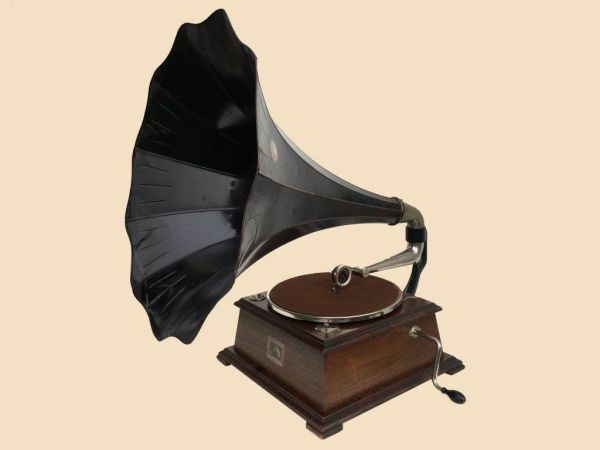 Because only the cases were locally produced in Calcutta (India) and any other (standard) parts came from England to India, the gramophone company adopted this model with an oak or mahogany case for the homemarket. Compared to other horn models the case of the model 25 had sloping sides (as the successors model 32 and 31 as well! ), so the back-bracket and the crank escutcheon had to be adapted. All other parts and components used on that model were not new and have already been consistently used in other models of the Gramophone Company. Altogether 596 pieces of this model were sold on the homemarket, of which 221 were mahogany. Das HMV 25 war eines der letzten Trichtergeräte, welches die Gramophone company Ltd. für den Heimatmarkt herstellte. Folgt man den Ausführungen des Buches "His Masters´s Gramophone", so entstand das Modell aus dem Umstand heraus, dass für dem indischen (Kolonial-)Markt nach wie vor Trichtergeräte produziert wurden. Da ausschließlich die Gehäuse lokal in Calcutta (Indien) produziert und alle anderen (Standard-)Teile von England aus nach Indien verschifft wurden, nahm man das Modell jeweils mit Eiche- und Mahagonikorpus ins Standardsortiment des Heimatmarktes auf. Entgegen anderer Trichtergeräte war am Modell 25 das Gehäuse besonders, da es abgeschrägte Seiten besaß (übrigens so, wie bei den Nachfolgern Model 32 und 31 ebenso!) und deswegen die übliche Standard-Trichterstütze sowie die Kurbelführung angepasst werden musste. 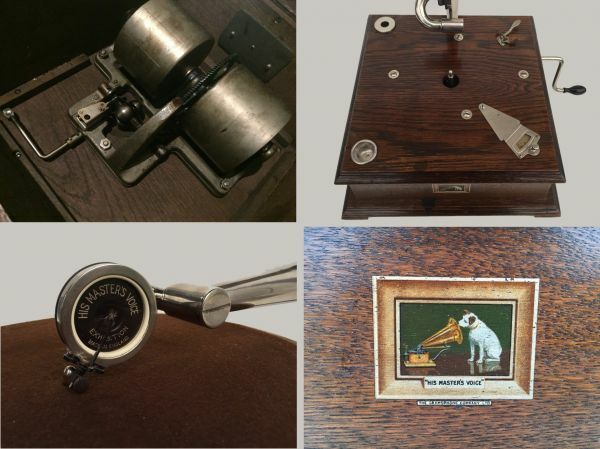 Alle anderen verwendeten Teile und Komponenten waren nichts Neues und wurden bereits durchweg in anderen Modellen der Gramophone Company verbaut. Insgesamt wurden 596 Stück dieses Modells auf dem Heimatmarkt verkauft; 221 davon 221 Stück in Mahagoni.